Cochae – Origami Hackers, Man Builds Railway Around His House, Shibuya Handmade Arts Festival, Edible Speaker and Microphone, Korobe-Kun Toilet Paper Dispenser, Pipe-Crawling Robot, Draw Your Own Numbers – Tegaki Clock, Face Detection in Processing, Musclesuit, LEGO Mindstorms Roly Poly, and DApendulum. This team of origami hackers creates special paper that can be folded to make 3d paper objects that are far from the ordinary. Simple origami takes on a distinctly collage-like color with their vivid papers. This interview by PingMag covers their humble beginnings, their creative process, and their unlikely rise as media darlings (they recently starred in a major TV drama as themselves!). Held at the art-bookshop & cafe’ in the bookstore-mecca Jinbo-cho area of Tokyo, this crafts fair brought out some of the best of the Japanese take on handicrafts. As seen above, the oft-crafted/baked Katamari Damacy characters were duly represented. Make:Japan brings us this delicious hack – It’s edible, sort of: the speaker cone is made out of a Baskin-Robbins ice cream cone, but the sound originates from the magnet and voice coil of a junked old speaker. The author claims that he got this idea because as a child he confused the words for “cone” and “corn” (in Japanese they’re pronounced the same) and went through life for quite some time believing that speaker cones were made out of corn paper, thus making them somehow edible. In honor of this possibility, once he got some sound from his speaker, he put a banana in the ice cream cone and ate it (he didn’t have any ice cream on hand, but writes that the banana+cone combo tasted just fine). In similar news, this same hacker has made a microphone out of household vinegar, an aluminum 1-yen coin, a copper 10-yen coin, and a cup to capture the sound. I’d say he’s just a few steps away from a fully edible PA system, he just needs to make some kind of amplifier out of ham sandwiches or something. At the Tokyo International Gift Show Autumn 2008, The Sasaki Co. showed their Korobe-kun which is a toilet paper dispenser designed to be easily operated with just one hand. Korobe-kun is intended for use by the elderly and handicapped who may not have full manual dexterity in both hands. It is currently being used in hospitals and hotels in Japan. Five colors are available so Korobe-kun can match any bathroom’s decor. It can also easily be detached for cleaning. I’d like to add this to their list of potential demographics: People too busy to be interrupted from their reading while holding portable electronic devices with one hand. Surely it’s not just me, right? This is why I switched back to velcro shoes. 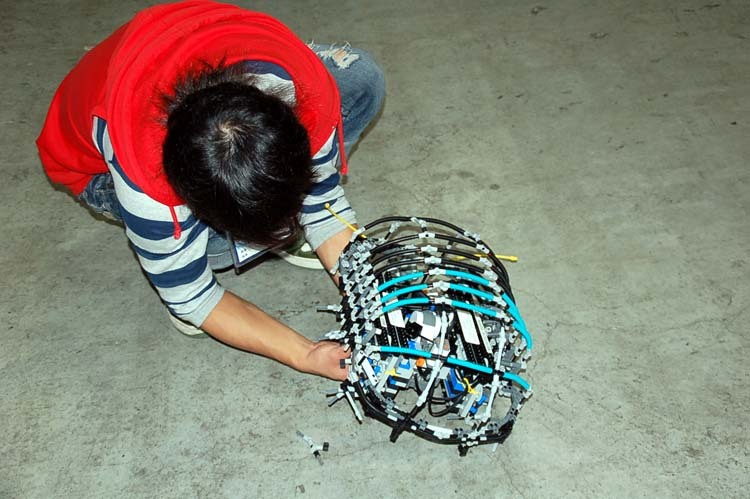 Here’s a robot spotted at the recent Kikikanri 2008 Rick Control Convention in Tokyo that is designed to crawl inside pipes to survey the situation. It’s lit front and back with a LED so that it can scoot from one end of a dark pipe to the other. It’s about the size of the palm of your hand, and would come in handy when the angles of pipes might make it otherwise difficult to peer into a system of pipes with a normal fiber-optic line. It’s a cute little thing now when it’s clean, but I’d hate to see what this lil’ guy looks like after a full day of hunting down greasy hairballs and other pipe obstructions. More creative coding from the Unknown Quality blog, this one lets you make web clock out of your own MS Paint-style mouse-drawn numbers. You draw your numbers 1-10, put in a decorative border if you like, hit the bottom right box (says “preview” in Japanese), and you’ve got your own hand-drawn clock with funky numbers (or nice numbers if you own a Wacom tablet, or if you are a genius at mouse drawing). You can’t save yet, but he’s planning on making it embeddable in a future release. Fun stuff. Yusuke Okamura of Physical Computing Forum made this test of the Facedetect library for Processing, with the position of the face controlling the 3D placement of the box along with a bunch of little balls of physics that react inside the box. As he notes, the tracking isn’t completely precise, but if you’re looking for a general face finder, this will get the job done for sure. Needless to say, I think we’ll be seeing lots of interesting uses of this library in the future. Here’s an interesting product demo from the recent Robo Japan 2008. Watch as they pile 10-kilo bags of rice into this man’s arms, first to see how many he can hold on his own (30 kg), and then to show the power-up provided by the muscle suit, allowing him to hold 50 kg of rice without any struggle. The upper arm is supported by three madmade “muscles” that provide supplemental support in lifting. The details are a bit sketchy as to how this is actually accomplished, but needless to say, those super hero-via-nerd Ironman fantasies have just become a little bit more real. Also spotted at Robo Japan 2008 was this Mindstorms roly poly. Check out a video at the link. It responds to loud noises such as clapping by rolling up (a little) and even has some creepy-crawly antennae to make it all the more authentic. I find this video to be totally intriguing. Here’s an experimental piece by Tatsuto Kawai for flute, Max/MSP, and laptop suspended on a bungee cord pendulum. At about two minutes in, the fellow on the right starts bouncing the computer on the pendulum, causing some kind of Theremin-like wailing (my guess would be it’s the aka.bookmotion Max object, sending Sudden Motion Sensor data to Max to control pitch). What I love is that fellow bouncing the laptop is following along with the sheet music the whole time. What would that notation look like? Perhaps it just says “bounce laptop now” a few measures in. At around 3:50, he turns the page and sits down. The genius of this piece comes at 6:15 when he stands up and dramatically cradles the laptop, as if he was a drummer doing a cymbal grab at the end of a song. It is at this point that you see that the floor by the pendulum is lined with curious white objects, iPods or something, maybe? I would be very interested to know.